On your visit to Cranberry House, step into the historical museum for an insight into island life, enjoy a tasty lunch at Hitty’s Café (with free WiFi), admire the 3 gardens, and explore Sammy Sanford’s cabin, and the public trail to Whistler’s Cove. Especially lucky visitors may arrive during one of the many entertaining and educational events held in the Arts Center. The Preble Marr museum and Hitty’s Cafe are open Memorial Day thru Columbus Day 10:00-4:00. Visit our calendar page to see what’s happening and when, from lectures to crafts to movies. Yes, we are open every day, (including Saturdays and Sundays) from Memorial to Columbus Day 10:00-4:00. Print out this map before leaving home; Cranberry House is #2. To get here you must take a ferry or hire a boat, leaving your car on Mt. Desert. Take the Beal & Bunker Mail Boat (from Northeast Harbor), or the Cranberry Cove Ferry (from Southwest Harbor or Manset). Walk off the dock, onto the main road (Cranberry Road). Cranberry House is on the right about 1/3 mile down the road atop a small hill. Hitty visitors note: you will pass the large white Preble House on the right, with lilac bushes in front, and the ancestral pine beside it. Cranberry House boasts the best and cleanest public restroom on the island! Cranberry House is handicap accessible, with ramps and a lift to get to all floors, and a handicap-accessible restroom. On hot days, refresh your dog at our dog lapping basin. 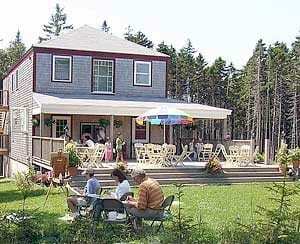 Free internet access is available on the outside deck for customers of Hitty’s Café.